Comparison of the classic manifestation of AE with the Prurigo manifestation, non-AE-associated PN and healthy controls regarding anamnesis, clinical examination, the immune system, molecular genetic and epidermal barrier. The tumor biology of head and neck squamous cell carcinomas (HNSCC). Hexokinase - regulator of host-microbiota interactions? Endoplasmic reticulum stress in IBD – key regulator of innate immune signalling? The RTG focuses on the environmental influence of chronic inflammation. The projects of the Research Training Group are designed to complement and strengthen one another with many shared aspects with regard to content and methodology. Central functions to maintain cell integrity, cell metabolism and host-defense mechanisms are tightly regulated by the surrounding microenvironment. Changes in systemic/local nutrient supply, oxygen tension or environmental cytokine milieu have been shown to dramatically affect not only the homoeostasis of cells and tissues but also of complete organs. Thus, tissue stress, malfunction, and destruction may induce inflammation alarm responses, which result either in resolution of tissue damage, restoration of normal cell function or develop into chronic disease. The latter is likely to be favoured by modern living conditions drastically different to those of early human evolution, such as exposure to novel exogenous factors of microbial and non-microbial origin (including high-calorie nutrients and a low level of physical activity) or endogenous signals produced by stressed or otherwise affected tissues over a long period of time. The influence of genetics, chronic inflammatory states and diet on the composition of skin and intestinal microbiomes are central topics of several TPs. A particular strength of the RTG is that different aspects of inflammation and different inflammatory diseases are studied. 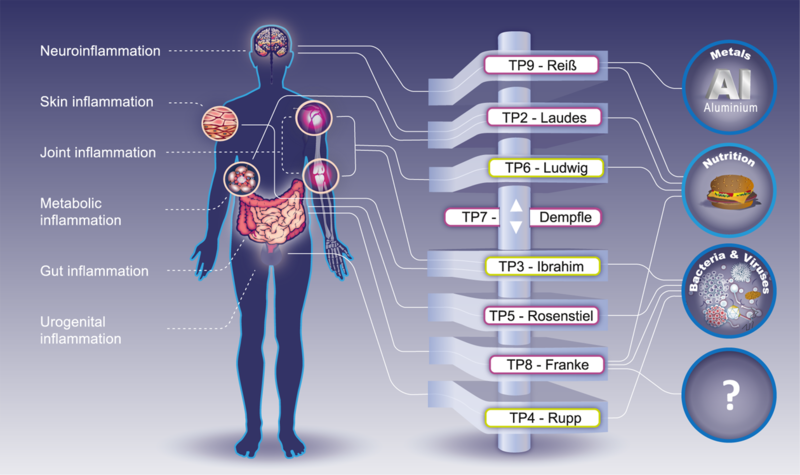 The illustration above shows the foci of the TPs in terms of “target organs” and environmental stimuli. This rather broad research focus has been proven to be very fruitful in the last years. The doctoral researchers are not only taught specific details for their experiments and projects, they also receive training in related disciplines. Moreover, the doctoral researchers widen their horizon in terms of the “exposome” and general inflammation concepts.